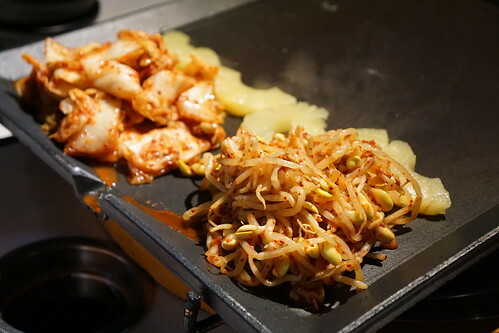 They serve kimchi, bean sprouts, and pineapple on the grill. Maybe they took a page from al pastor tacos with that pineapple? It's nice to cut the fat with. 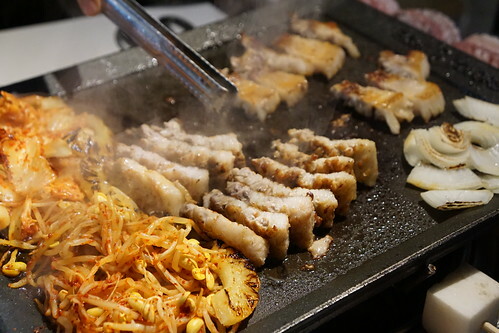 The servers helped us grill the meat on the table - from putting it on the grill, flipping it, and cutting it for us. 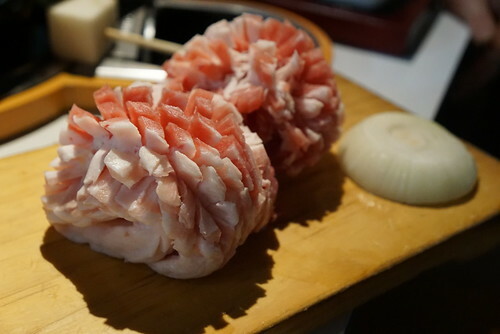 They also cut out all the gristle from the meat. There was an opening on the grill, which was tilted to drain the grease from grilling the meats down to the hole on the table. That was a pretty neat way to keep the grill clean and less greasy. There's quite a bit of banchan too, from tofu to potato salad and radish. 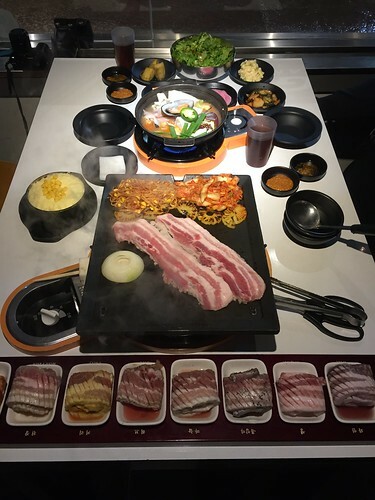 They serve salad and rice paper to eat your bbq with. 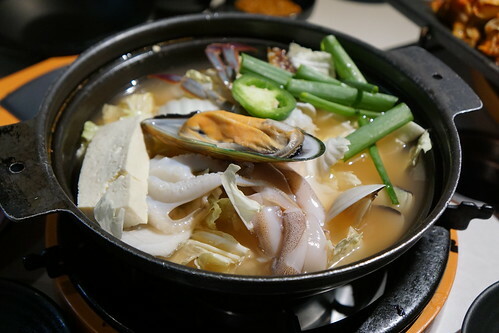 The seafood stew was filled with plenty of mussels, squid, tofu, shrimp, etc. 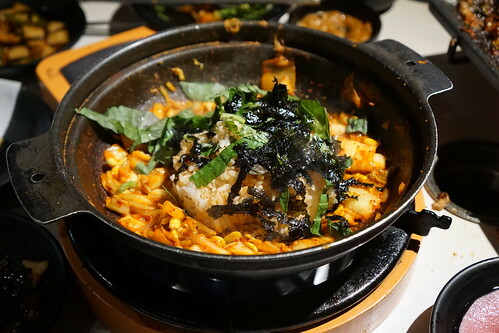 After the soup and meat are done, they use the leftover broth to make kimchi fried rice! 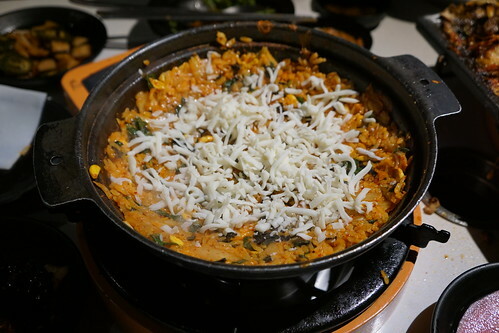 More importantly, MOZZARELLA kimchi fried rice. We were stuffed but I had to have some cheesy kimchi fried rice anyway. In the end we took a lot of food home, but I'm happy that I got to try everything. 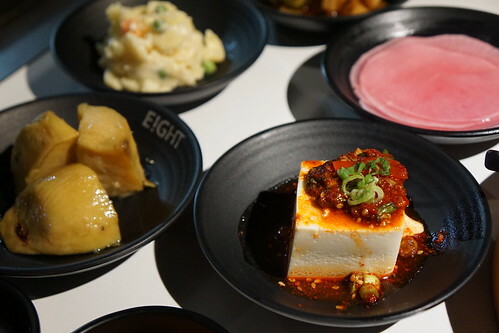 I'm happy that the Eight Korean BBQ rebrand meant better flavors for the pork belly, new hit dishes, and better overall service. Other things to note: their stool opens up for storage, so you can store your jacket/purse through the night and they won't smell like korean bbq (not as much at least). The combo was a lot of food that would've been enough for 3 people, so the $56.99 price was pretty good. 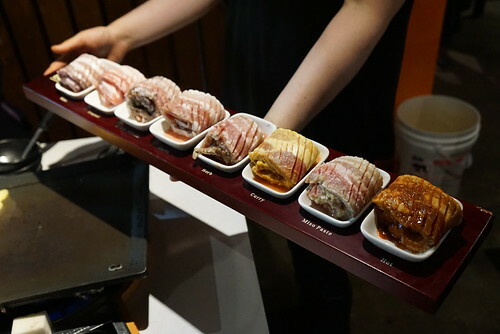 If this seemed like too much pork belly for you, grab more people and order the beef dishes too.